Unless an alternative, low-carbon solution can be found for Canada’s trucking sector, the greenhouse gas (GHG) emissions from diesel fuel combustion will seriously undermine Canada’s efforts to achieve the 2030 and 2050 commitments made in the 2015 Paris climate change accord. Those commitments include a 30% reduction in GHG emissions from 2005 levels by 2030, and what amounts to an 80% reduction in emissions by 2050. Clearly, transformative – even disruptive – changes are required in the fuelling of freight transport in this country and across North America. As discussed previously, policies and programs focused on improving fuel consumption and operating efficiency, such as Canada’s Heavy-Duty Vehicle and Engine GHG Emissions Regulations, or Natural Resources Canada’s SmartWay program, are important in slowing the growth of freight emissions, but cannot deliver the reductions needed for the Paris targets. That will require a major change away from fossil-based diesel fuels that have long dominated the trucking industry by providing the range, reliability, capacity, and pulling power attributes that are valued by the sector. Figure 1. Average Operating Cost Profile of a Canadian Long Distance Truck. Data from Statistics Canada’s CANSIM tables 403-0009 and 403-0004 assuming 17 tonnes driven 750 km. Costs may not reflect actual cost of truck transportion for all given situations. Renewable Fuel and Clean Fuel standards do support a transition to non-fossil fuel alternatives but given the relatively low cost and plentiful supply of diesel fuel today and the ubiquitous presence of diesel engines in existing and new fleets, it is difficult to see how, by themselves, these standards will be able to achieve transformational change at the pace that is required to reach our targets – especially if the alterative comes at a higher cost or does not meet or beat the current performance standards. An analysis of the costs associated with freight transport supports this assessment (Figure 1). At about 23% of the overall cost of freight transport, any substantive increase in fuel and/or vehicle costs will be strongly resisted, not only by the freight sector but by other sectors of the economy that rely on their services. So, do we just give up on efforts to reduce the carbon footprint of the freight sector? No, the climate change issue is too important. To address the GHG problem, the freight sector needs to undergo transformative change; however change of this magnitude will need to derive benefits for key stakeholders that are beyond just the reduction of GHG emissions. There are other economic, health and environmental reasons for transformative changes in North America’s trucking system. Figure 2 identifies some of these. They range from inefficiencies in the use of time and resources (e.g. low load factor, asset utilization, productivity), to the accidents and air pollution that impact human health. a)	Source; b)	Source; c)	Source; d)	Source; e)	Source; f) Source. If governments were to encourage those transformative changes that are capable of delivering tangible benefits in these other areas, it should be possible to gain the support needed to rapidly decarbonize the freight sector. Indeed, when you consider the broader range of challenges facing freight transport in Canada, implementing transformative systems change that address only the GHG emission problem could be seen to be a wasted opportunity. Unquestionably, there are many technology and business model innovations that are poised to fill the value gap in the freight and supply chain sectors including hyperloops, autonomous trucks, delivery drones and electric vehicles as well as digital innovations such as block chain, physical internet, and intelligent transportation systems. While some of these might seem more credible and compelling than others, it is clear that the freight transportation sector is ready for change. To ensure that these changes are of the nature and magnitude needed for Canada to meet its climate change targets, there is an important role for policy intervention to encourage, discourage, nudge or otherwise ‘direct’ the disruptive innovations. Capable of reaching the target. Just as there are many possible disruptive innovations, there are many pathways that could be envisaged to realize a desirable future for freight transport in Canada. By taking a holistic approach that considers systems level changes capable of achieving more than just environmental objectives, it may be possible to meet our climate change targets plus a long list of other important societal objectives, and still have money in our pockets at the end of the day. The team at CESAR has identified one such pathway that includes a strategic combination of disruptive innovations. We then use exploratory modelling tools to assess and generate a scenario for the envisioned pathway. In defining the Pathway, we first work to identify the most important driver for transformative systems change in the sector of interest. In freight transport we see this to be autonomous (driverless) trucks. It is not hard to see their appeal, since such vehicles should be able to address the problems of labour shortages and accidents while improving productivity and asset utilization. The end result will be a reduction in the cost of freight transport. When coupled with digital connectivity technology, the autonomous trucks could make the freight transportation system even more efficient by reducing congestion and improving load factor. Though innovative technologies such as block chain, intelligent transportation systems, and the physical internet, freight transportation could become more transparent and interconnected, and improve operational efficiency and productivity by fostering a collaborative environment between various stakeholders. However, significantly lowering the cost of trucking has the potential to threaten climate change goals by encouraging more goods movement, or by driving a shift in freight mode to trucks from more energy efficient railway transportation. Over the past 25 years, increases in demand for truck transport have been the top contributing factor for increases in transportation-related GHG emissions. The increase in demand associated with the autonomous truck could have serious negative consequences in terms of GHG emissions – especially if the trucks continue to be operated with energy intense, diesel combustion engines. This helps to highlight the importance of the third potentially transformative innovation: electric trucks. 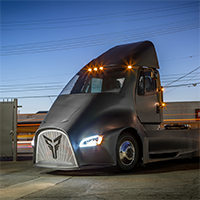 Tesla, Nikola Motors, Toyota, Daimler, and others have been generating considerable attention for an electric truck powered by grid charged batteries or by hydrogen fuel cells or both. Figure 3. Estimated Cost Profile for an Autonomous, Connected and Electric Long Distance Truck. Calculated from Figure 1 data assuming (a) drivers represent 70% of salary, wage, and benefit cost and this portion of the cost is reduced by 90%; (b) asset cost is increased by 40% but offset by a 2 x increase in use rate; (c) 30% lower mainenance cost; (d) no change to fuel and G&A costs. Never before has the trucking sector generated so much excitement. And rightfully so. If the Canadian trucking sector is able to embrace the adoption of either battery electric trucks or hydrogen fuel cell truck technology that converts hydrogen to electricity, we can eliminate all tail-pipe emissions (other than water) that are currently associated with diesel fuel use in the sector. While the capital cost of an autonomous, connected, electric truck may be more than the current human-driven truck, electric trucks will have fewer moving parts so the maintenance cost should be lower and the vehicles should have a longer lifespan. Moreover, with autonomy and connectivity, the asset utilization rate should increase, lowering the cost of asset depreciation per km travelled. Figure 3 provides a conservative estimate of the cost profile for future autonomous, connected and electric truck transport based on modifications to the current cost profile that was shown in Figure 1. The truck of the future will have significantly reduced labour and insurance costs while fuel costs become an even larger proportion of the overall cost of freight movement. When compared to the existing truck technology (Figure 1), long-distance trucking with an autonomous, connected and electric should be 23% lower: from approximately $2.00 per kilometre to about $1.54 per kilometre per trip. Given the concept of a disruption in freight transportation driven by a convergence of innovations around autonomous, connected and electric vehicles, we have created a scenario model for a transition pathway that we feel is credible, compelling and capable of meeting Canada’s 2050 target. Sale of these vehicles would begin in the early 2020s and reach 50% of market share by 2030, and 100% by 2040. Ten years later, in 2050, about 90% of the vehicles on the road would be electric (Figure 4A). By 2040, about 50% of the tonne-kms travelled by truck would be carried on autonomous, connected and electric vehicles, rising to 90% by 2050 (Figure 4B). By 2050, tailpipe GHG emissions for this sector are projected to be 20% of 2005 level of emissions, effectively achieving Canada’s commitment to do its part in keeping global climate change below 2C. (Figure 4C). Compared to a reference scenario, annual GHG emissions by this sector would be 58 million tonnes CO2 . Figure 4. Scenario Analysis of a CESAR pathway capable of achieving Canada’s 2050 climate change target. See text for details. The scenario was modeled by CESAR using the Canadian Energy Systems Simulator (CanESS) program from whatIf? Technologies Inc. (Ottawa, Ont). In addition to the GHG benefits in 2050, harmful air pollutants from the trucking sector would be all but eliminated; the same pollutants that have motivated the planned moratoriums on the diesel vehicles in places like Paris, Madrid, Athens, Mexico City as well as some cities in Germany. Reductions in noise pollution would be an added bonus. From an environmental perspective, the electric truck is a dream come true. But realistically, what is going to motivate Canadian carriers and shippers to invest in these vehicles? In our analysis, we agree with recent work by McKinsey and others that – on their own – the environmental and cost benefits of heavy-duty vehicle electrification are not likely to achieve the kind of transformative change needed to meet mid-century climate change commitments. However, if electrification of medium- and heavy-duty freight vehicles were to be coupled to autonomous and connected vehicle innovations, together, they could provide the necessary market pull to realize transformational change. This could be done with forward-thinking policy instruments that could range from regulations requiring electrification of autonomous vehicles, to investing in charging and/or hydrogen refuelling infrastructure, or enabling a network of multimodal terminals in support of a physical internet.